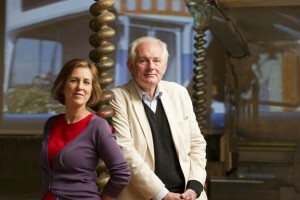 Diverse Productions are doing a program for the BBC called Home Movies presented by Kirsty Wark and Dan Cruikshank. The program involves a lot of time sitting on sofas talking to experts interspersed with home movies and this is where the real visual interest comes from so I wanted to incorporate this in the background of my publicity shots I was commissioned to take, as well as capture an essence of Wilton’s Music Hall where it was filmed. I had plenty of time to think about what to do, but the usual few minutes to execute it… Here is how: DVD projector onto back wall, soft box bounced off the lowered ceiling on right, Kirsty and Dan were grabbed between takes, job done!